Scree is a collection of broken rock fragments at the base of crags, mountain cliffs, volcanoes or valley shoulders that has accumulated through periodic rockfall from adjacent cliff faces. Landforms associated with these materials are often called talus deposits. Talus deposits typically have a concave upwards form, while the maximum inclination corresponds to the angle of repose of the mean debris size. The term scree comes from the Old Norse term for landslide, skriða, while the term talus is a French word meaning a slope or embankment. Scree formation is commonly attributed to the formation of ice within mountain rock slopes. During the day, water can flow into joints and discontinuities in the rock wall. If the temperature drops enough, for example in the evening, this water may freeze. Since water expands by 9% when it freezes, it can generate large forces that either create new cracks or wedge blocks into an unstable position. Special boundary conditions (rapid freezing and water confinement) may be required for this to happen. Freeze-thaw scree production is thought to be most common during the spring and fall, when the daily temperatures fluctuate around the freezing point of water, and snow melt produces ample free water. The efficiency of freeze/thaw processes in scree production is debated by scientists. Many researchers believe that ice formation in large open crack systems cannot generate high pressures, and instead suggest that the water and ice simply flow out of the cracks as pressure builds. Many argue that frost heaving, like that known to act in soil in permafrost areas, may play an important role in cliff degradation in cold places. Scree can conceal a glacier. For example, Lech dl Dragon, in the Sella group of the Dolomites, derives from the melting waters of a glacier, hidden under a thick layer of scree. The melting process of the underlying glacier is slowed by the protective layer of scree. Eventually, a rock slope may be completely covered by its own scree, so that production of new material ceases. The slope is then said to be "mantled" with debris. Wikimedia Commons has media related to Scree. 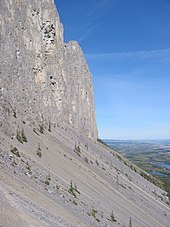 Look up scree or talus in Wiktionary, the free dictionary. ^ Harper, Douglas. "scree". Online Etymology Dictionary. Retrieved 2006-04-20. ^ Harper, Douglas. "talus". Online Etymology Dictionary. Retrieved 2008-12-01. ^ "Talus". bab.la language portal. Retrieved 2011-12-10. ^ Whalley, WB (1984). "Rockfalls". In Brunsden, D.; Prior, DB. Slope Instability. Chichester: John Wiley and Sons. pp. 217–256. ^ Hallet, B (2006). "Why do freezing rocks break?". Science. 314 (5802): 1092–1093. doi:10.1126/science.1135200. PMID 17110559. ^ Walder, J; Hallet, B (1985). "A theoretical model of the fracture of rock during freezing". Geological Society of America Bulletin. 96 (3): 336–346. Bibcode:1985GSAB...96..336W. doi:10.1130/0016-7606(1985)96<336:ATMOTF>2.0.CO;2. ^ Murton, JB; Peterson, R; Ozouf, J-C (2006). "Bedrock fracture by ice segregation in cold regions". Science. 314 (5802): 1127–1129. Bibcode:2006Sci...314.1127M. doi:10.1126/science.1132127. PMID 17110573.